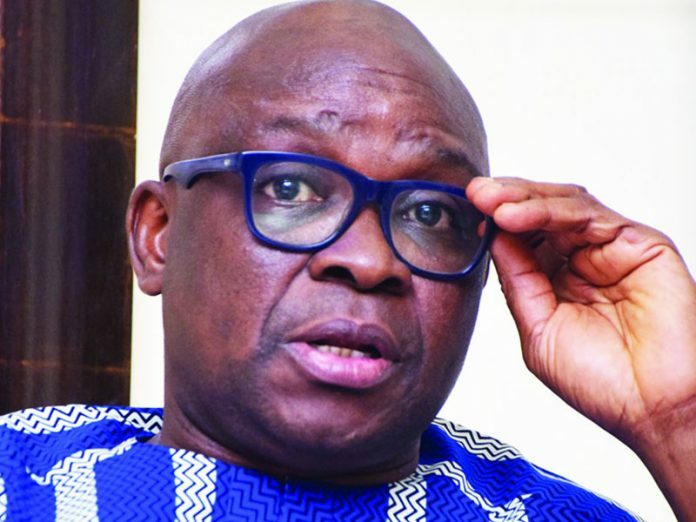 Following the alleged damage to his property by Ekiti State Government and Hajaig Construction Company, the Deputy Governor-elect of the state, Chief Bisi Egbeyemi, has sued Governor Ayodele Fayose and the contractor, seeking a compensation of N500 million for the havoc wreaked on his private property. Joined in the suit is the state’s Attorney General and Commissioner for Justice, Mr. Kolapo Kolade. Egbeyemi, owner of Crownbiz Hotel located along Ado-Iworoko road, resorted to litigation following the damage to his property, which was overrun by flood due to alleged shoddy execution of the road project by the contractor. The chieftain of the All Progressives Congress (APC), in a suit filed before an Ekiti State High Court, accused the contractor, HAJAIG Construction Nigeria Limited of negligence in handling construction work on Ado-Ifaki Road and the bridge on Ofin River. The deputy governor-elect in a suit filed by his lawyer, Adedayo Adewumi, is seeking general damages of N500 million for the negligence allegedly caused by the defendants. Egbeyemi is also seeking an order of the court directing the defendants to pay another sum of N46.5 million as special damages, being the cost of the property of the claimants damaged as a result of the negligence of the defendants. The plaintiff also prayed the court to give an order directing defendants to find permanent solution to the flood threatening the Crownbiz Hotel, situated at Kilometer 4, Opopogboro, Iworoko Road in Ado-Ekiti. The last relief sought by Egbeyemi was that the court should order the defendants to pay the cost of the suit filed. In his statement of claim attached to the Originating Summons,Egbeyemi averred that the second defendant (HAJAIG) “did a poor job, especially the bridge on the Ofin River which is close to the hotel. The plaintiff averred that at the time of filing his suit, the second defendant had not completed the job. Attached to the Originating Summons are Egbeyemi’s witness statement on oath, engineering report, letters written to Ekiti State Government, plans and photographs showing alleged acts of the defendants in his properties. Egbeyemi averred: “The contractor constructed a ring culvert instead of box culverts. The bridge that was there before the contractor bulldozed it was a colonial box culvert, which allowed the river and the flood entering the bridge from the town to flow without blockage. “The second defendant failed to construct the line drains at Crownbiz Hotel area and it also refused or neglected to construct culverts that were broken or removed by them. “The blockage brought a great flood disaster to claimant’s hotel through its gate and in June 2014, the hotel rooms were flooded and caused damages to properties in the hotel, all the 35 rooms, kitchen, reception and small hall.